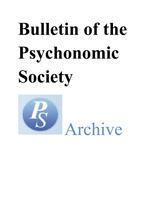 Bulletin of the Psychonomic Society was an official journal of the Psychonomic Society. It was published between 1973 and 1993 by the Psychonomic Society. The journal is no longer active and it is not accepting submissions. We are pleased to provide you with access to all articles published in this journal, as part of the Psychonomic Society Archive on SpringerLink. For more information, please see links on the right. For questions about this journal, please contact a member of the Psychonomic Society Publications Committee. Information about the Committee may be found under the 'Society' link. For Rights and Permissions questions related to this journal, please contact Springer’s Rights & Permissions department at the link on the right. Are you interested in submitting an article to one of the six Psychonomic Society journals that are active today? Please visit the 'Psychonomic Society Journals' link.